Over the weekend I made my first two Joy the Baker recipes ever. Quite shocking really when you consider the friend crush I've had on her for some time. The admiration has grown as Benjamin and I have taken to listening to her podcasts thanks to Homefries. They're easy to listen to, down to earth, and hilarious. I highly recommend them to get your mind off things for a bit and listen to two girls talk about everything and nothing all at the same time- in the best way possible. 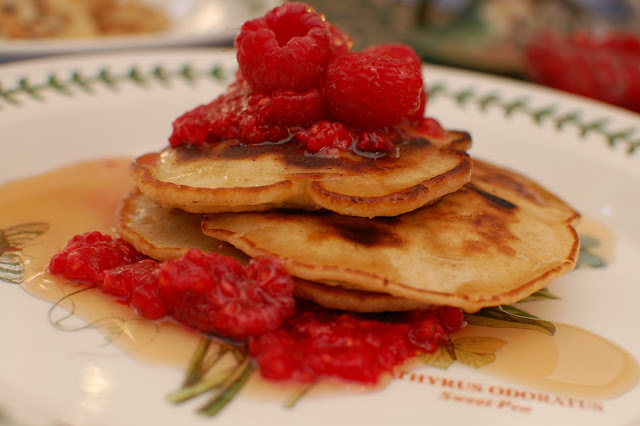 While we spent a couple days at my parents I saw her recent post about raspberry and chocolate chip pancakes. I really don't like mixing chocolate and fruit, but I knew we had the ingredients so I decided I would give them a try. Delicious- and that's coming from someone who doesn't like chocolate and fruit. I used dark chocolate chips and didn't have buttermilk but just used regular milk and added a splash of vinegar to it. 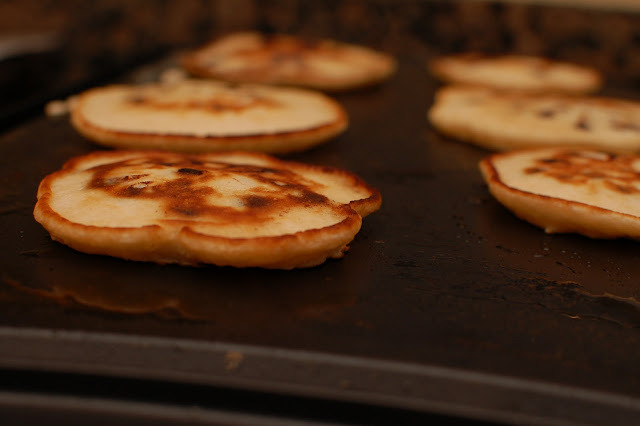 For the recipe from the one and only, check out Joy's post here. 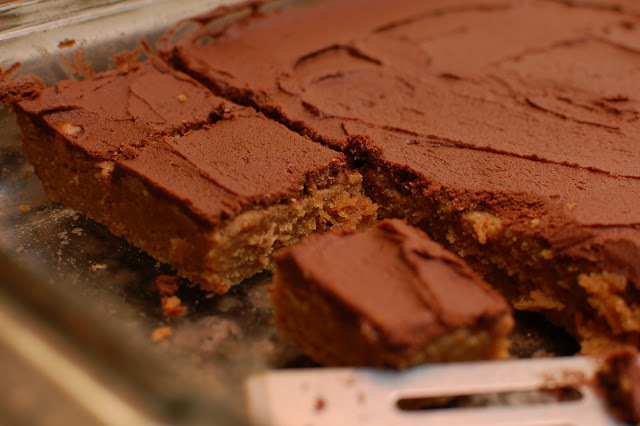 Before we headed back I had the itch to make something else so I turned to Joy's Peanut Butter Blondies with Chocolate Frosting. I used semi sweet chips instead of milk chocolate and left them at my parents to have for smallgroup. I hope there are some left and that I'll get another bite or two when I see my Mom on Thursday. I first had these brownies when my friend Kara had me over for lunch and I ate three in one sitting. I was pregnant and justified the extra brownies for the babe. It's a good thing I didn't take them home however as I would have eaten 6 and Benjamin would tell me how he doesn't like sweets. Silly Benny. Regardless, once again here's the recipe from Joy. Really delicious. oh my goodness! 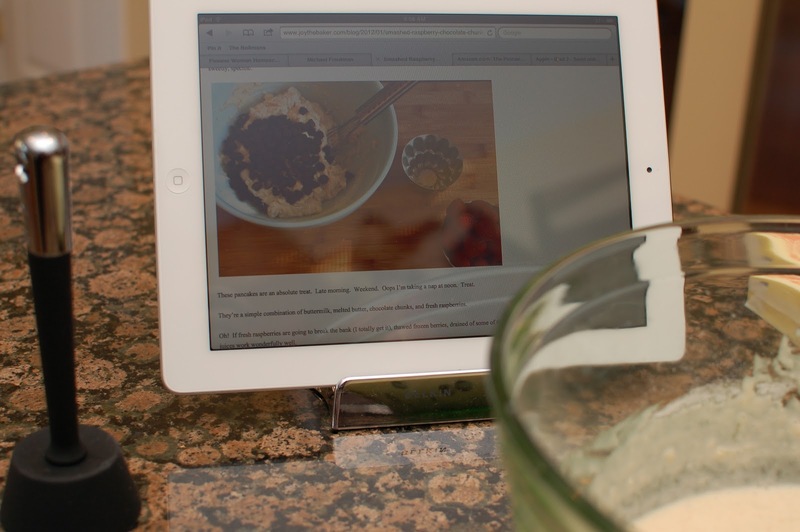 i LOVED seeing my recipe on your ipad. i can't even tell you how happy that made me! the internet is magic! your pancakes aaannndd brownies look totally amazing! and thanks so much for supporting the podcast too! you're tops! thank you for everything!